We were searching for a decent commercial WordPress theme to build one of our website. After looking around on different marketplaces, we struck at the attractive options offered by Uncode theme. We have purchased and built a portfolio site using Uncode theme and here is a genuine review for those who are looking for buying the theme. You can purchase the Uncode theme from Themeforest marketplace for $59. The cost is for a single site license with six months of free support. Though the theme was advertised as a multiuse theme, definitely the portfolio capabilities make the theme more popular than any other reasons. In our opinion, the cost is at higher range compared to other multipurpose themes like Highend with portfolio capabilities. You can install and activate the theme through WordPress admin panel or upload the unzipped theme files in “/wp-content/themes/” folder through FTP. If you want to have a site like demo then most of the plugins are necessary to be installed on your site. But we strongly recommend activating only required plugins for you and not all. For example, you should only install either revolution or layer slider. Installing both slider plugins is not required on a single site unless you love to have both. Uncode theme has large number of demos as shown in the sales page. Unfortunately you can’t create an individual demo site, either you need to install the complete demo or choose the layouts you want. Below are the demo import options available under “Uncode > Install Demo” section. Import layouts – complete demo import. This includes all placeholder images, more than 150 posts, pages, portfolio items and content blocks. Single layouts – choose individual layout for importing. There are more than 100 layouts available under different categories. Theme options – import theme options as shown in the main demo. Import menu – import menu as shown in the main demo. Widgets – import widgets as shown in the main demo site. If you want to import all layouts then ensure to you have sufficient memory and PHP max vars input configured on your server. You can check the server status under “Uncode > System Status” and increase the memory / max vars input accordingly. 1. Ensure to hide the search from search engines, till the time your final site is ready for publishing. Otherwise your demo content will be indexed in Google. Also you can use staging site or localhost for development before going live. 2. Remember to delete all unnecessary demo posts / pages / comments / portfolio items when your site is finished for live publishing. 3. Remember all imported images are just a placeholder images and not the real images as shown in the demo. You can delete all imported media files with single click on “Delete Demo Media” button. The best way to get started with Uncode theme is to install all the demo content and start modifying the layouts on your site. Uncode is a unique theme and differ from other general purpose themes. It works basically with content blocks which are assigned to header, footer, page, content and related section of the layouts. You can also assign the content blocks for different layouts like single portfolio pages and archive layouts. 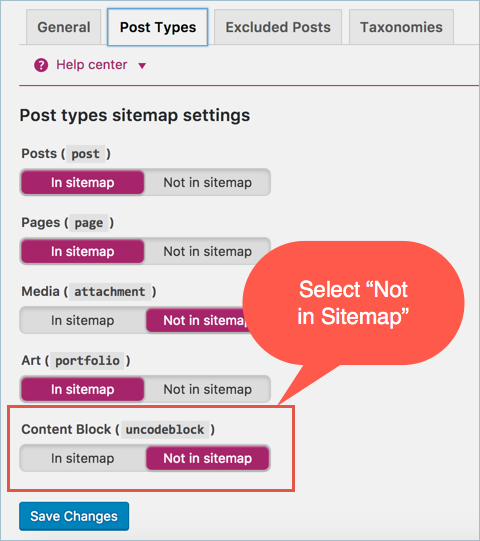 Ensure content blocks are not indexable by search engines by hiding them in Sitemap. You can do this easily with one of the SEO plugins like Yoast SEO. 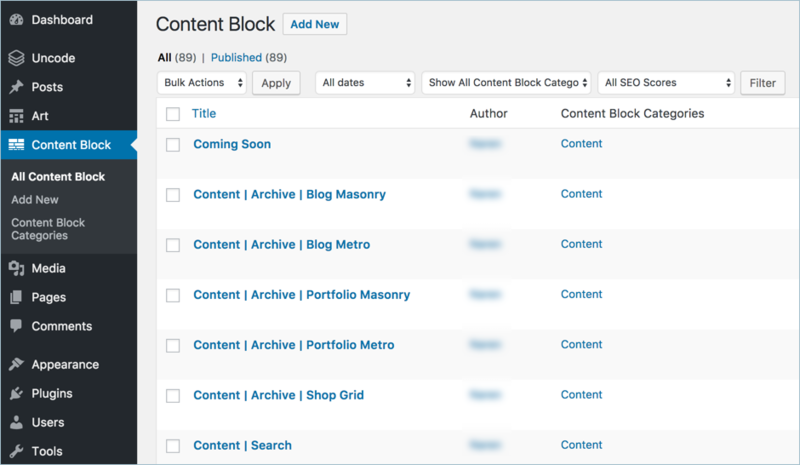 Do not delete the predefined content blocks, as they are required for different layouts of your site. Navigate to “Uncode > Theme Options” and setup the global settings for individual post/page/portfolio layouts. 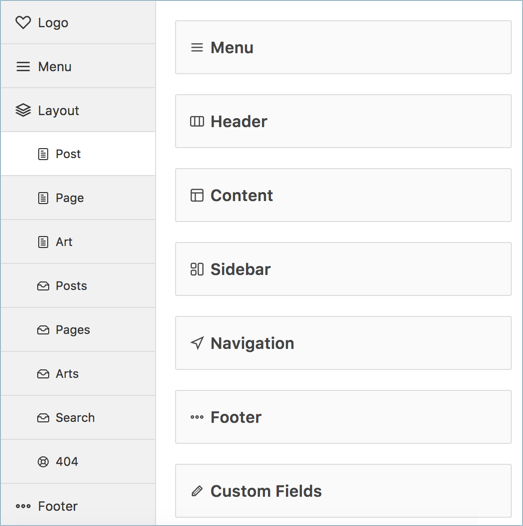 Setup menu, header, content, sidebar, navigation, footer and custom fields details as needed for your site. 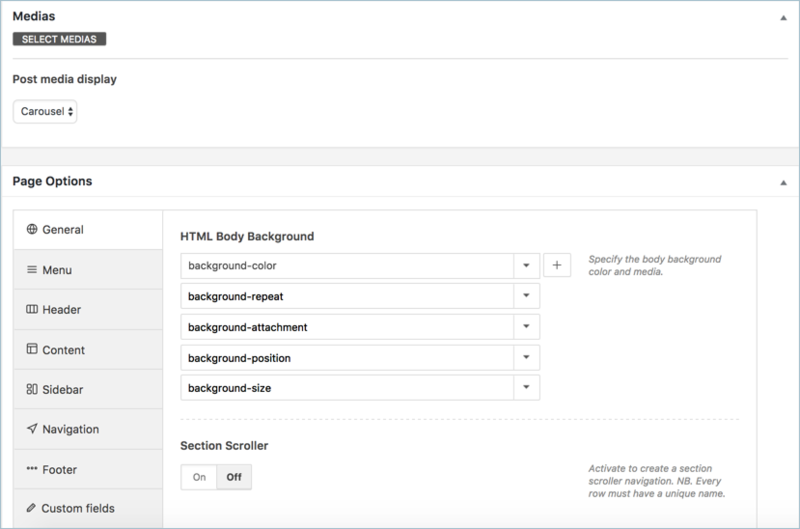 There are huge sets of options available under “Theme Options” for social profiles, custom CSS/JS, sidebars and performance improvements. 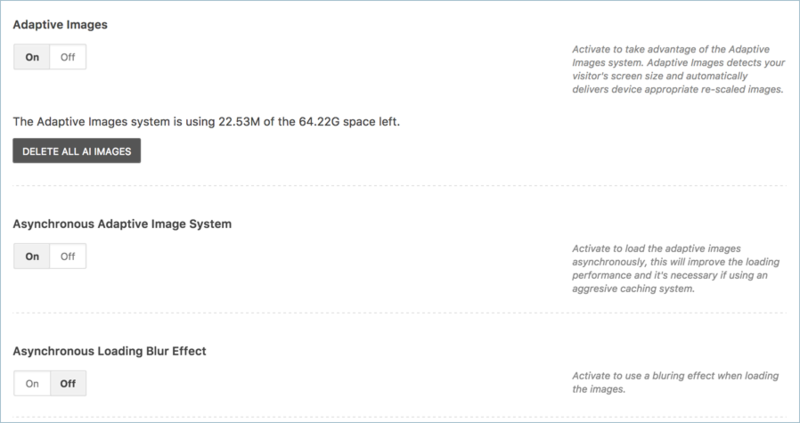 For example, enabling “Adaptive Images” under “Performance” tab will help you to serve resized images on mobile devices for improving page speed. Besides normal visual editor, Uncode theme has two important additional meta boxes. One is for adding medias using Visual Composer in carousel, stack and isotope format. The other is a page options to change the global settings defined under “Theme Options”. Getting support from Uncode developer is a lengthy task. You need to click the “Uncode Help > Documentation” menu from the top admin bar on WordPress dashboard. Again you need a separate login or authorize your themeforest account to access the Uncode help center. Finally you will see the place to submit your request or refer online documentation. The forum previously used for supporting Uncode theme was abandoned without migrating the content to new help center. This is a concern as previously reported issues could not be referred. We found some bugs on the theme and the support guy forwarded to advanced technical support team. For every query, it will take at least a day to get response. Anything other than general query needs to be addressed by their technical team and bug fixing on your site will take longer time. The theme comes with six months of free support. Hence, you should setup the theme before six months and resolve all issues on your site. Otherwise you need to extend the support for another one year by paying additional $17.63. Theme comes with bundled plugins – Visual Composer, iLightbox, Slider Revolution and Layer Slider. With different content blocks, you can create any type of layouts you want for your site. Huge demo data allows reusability of predefined layouts and will save lot of time for you. Adaptive images option allows you to serve scaled images on mobile devices. Each part of the layout like menu, header, footer and content section can be customized to create unique layout for your site. Completely integrated with Visual Composer to build highly customizable layouts. Easy to create WooCommerce store and integrated with Contact Form 7. It will take some time for understanding the theme structure with content blocks. $59 is high compared to similar range of commercial themes. Installation of complete demo content needs sufficient PHP memory and max vars input of >3000. You should increase the resources using php.ini file or request your host to setup for you. Some of the hosts may not allow this especially when you are in a shared hosting environment. Visual Composer is customized to use as a mandatory plugin for the theme to work properly. This indicates, you will never be able to migrate to another theme later without buying Visual Composer plugin. Even you buy, it is not guaranteed that standard Visual Composer plugin will work when you change the theme. Google PageSpeed score of their demo content is around 30/70. Yes, the score is as low as 30 on mobile devices (it was 10 on our site). The reason is the adaptive image system will not work out of the box. You may need to configure the image sizes or install separate adaptive image plugin to serve resized images on mobile devices. Uncode theme is definitively an attractive theme for building your WordPress site. But you may feel difficulties in importing large demo content then deleting them. Theme is completely built to work with Visual Composer which may put you in trouble when you want to switch the theme later. On other hand, we have checked multiple free and commercial themes for building a portfolio site. But could not find a good one like Uncode. In our opinion, we would recommend buying Uncode for building WordPress portfolio site. For general purpose sites, you may feel exhausted with different concept of using content blocks and adaptive images. There are thousands of general purpose commercial themes that offer easy options than Uncode for much lower price. Uncode has been my favourite theme for the past year, the versatility is great. The only downside for me is the Woocommerce integration, it works very well but doesn’t handle custom hooks if using the custom layouts for the shop pages.